Attending med school in California is something many medical school applicants dream of. Why? First of all, for in state California residents, the tuition is much lower at state funded schools. Even for out of state students, California medical schools have lower tuitions than most private medical schools. All of the medical schools in California have great reputations that help medical students earn top residencies. In fact, some of the best medical schools in the country are in California. Stanford, University of California San Francisco, and University California Los Angeles are all ranked in the top ten for research by US News and World Report. Because California medical schools are so desirable, they receive huge numbers of applications each year making California medical school acceptance rates very low. Applying to medical schools in California? Click here to sign up for a FREE 15 minute advising session with one of our medical school admissions experts. 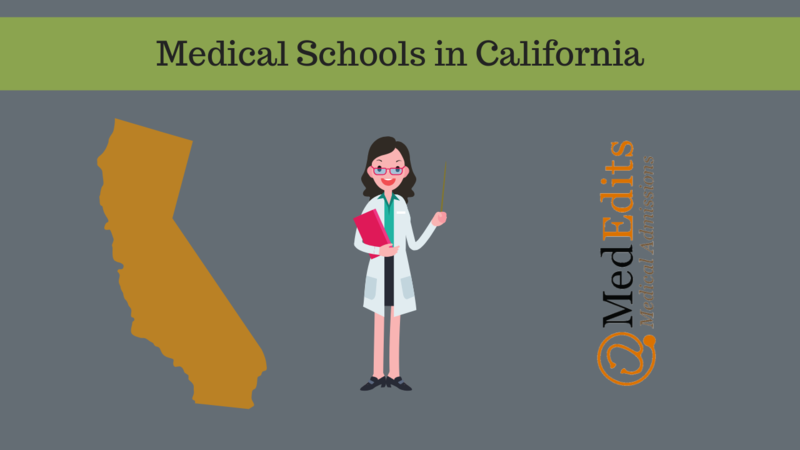 How Competitive are you for Medical School Admissions in California? To determine your competitiveness for a California medical school you must review the average MCATs and GPAs for accepted students as well as the California medical school acceptance rates. For out of state students, it is important to pay attention to how many out of state students are interviewed and what percentage of out of state students matriculate each year. So, how difficult is it to get accepted to a California medical school? Let’s review the data. Below are the average MCAT scores and GPAs, interview rates for in state and out of state applicants, acceptance rates, percent of entering class that is in state, and tuition for all medical schools in California. So, what can you do to increase your chances of getting accepted to a California medical school? 1) Be realistic about your competitiveness and do what you need to improve your chances. When deciding when to apply to medical, you should consider how your average GPA and MCAT compares to the school’s average GPA and MCAT for accepted students. If your GPA and/or MCAT are lower than the California medical schools you would like to attend, consider boosting your GPA or MCAT to make yourself more competitive. You must also consider your state residency; many California medical schools admit the majority of students from within the state. 2) When you complete secondary essays, do so thoughtfully and considerately. The majority of UC medical schools screen applications so only a certain percentage of applicants receive secondary applications. Therefore, it is important to make sure your secondary essays distinguish you and highlight what you will bring to the medical school community. 3) Don’t try to spin your documents, secondary essays, or interview responses to “fit” a certain medical school. All medical schools are looking for diverse medical school entering classes. No medical school, for example, wants a class full of students who have NIH funded research or a an entire class of students who have been community service leaders. Always be true to yourself, your ideals, and your interests. If you have the stats to be a competitive applicant for a California medical school, what is most important is to address every secondary essay, every interview question and every MMI scenario authentically and honestly. Trying to “tell them what you think they want to hear” can actually undermine how you are perceived and decrease your chances of success.